As mentioned in our main page dedicated to the Parker SR1 Shavette, the Parker SR1 shavette is made by Parker Safety Razor. It is made entirely out of stainless steel except for the pins that hold the components together and the “position pins” that keep the blade in place. 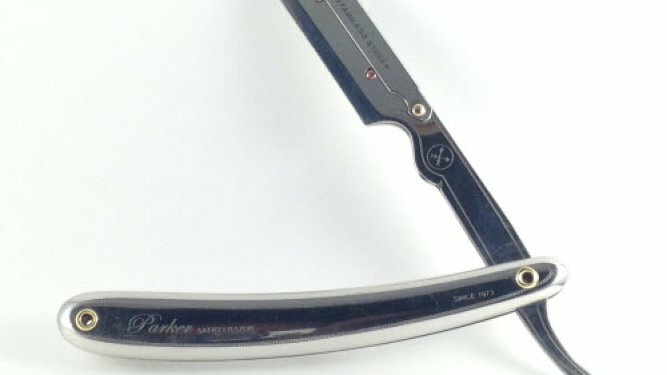 For the longest time I held off on purchasing a Parker shavette. I saw them on Amazon and other websites, but to me they just weren’t that visually appealing. Something about the design just turned me off to them. Despite my reservations about their looks I noticed that they had good reviews on Amazon, so I decided to purchase a SR1 model and see how it shaved. 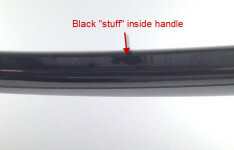 When the SR1 arrived I took it out of package and inspected it.One of the first thing I noticed was that there was some sort of black residue on the blade arms next to where they attached to the handle. My guess would be that it came from some part of the manufacturing process. It came off pretty easy with some q-tips and rubbing alcohol. The second thing that caught my eye was that there was some pitting on the blade arm clip. Since the blade arm clip holds the blade arms together this was nothing to worry about, but I was a little surprised to find it seeing as it was a brand new razor. The last thing I noticed was another black substance located between the two halves of the handle. Again I imagine it has something to do with the way it was manufactured. It looked as if the outside of the razor was washed and then the resulting water/black substance mix found its way to the inside of the handle and dried there. 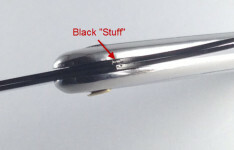 The SR1 came with a small piece of paper showing how to open the razor up in order to place the blade in. I found the instructions to be accurate and concise. 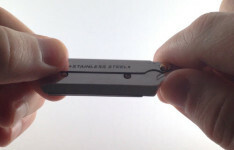 Loading the blade is a simple matter of lifting the blade arm clip, separating the blade arms from each other, inserting the blade, putting the blade arms back together and lowering the blade arm clip. The actual performance of the steps is pretty simple as well. The blade arm clip fits pretty snugly, so it takes some force to open it. 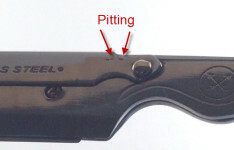 Fortunately, it appears the company anticipated this and provided a little notch behind where the blade sits that you can place your thumb to get some leverage to open the blade clip. Aligning the blade on the position pins was also easy. However, I did find it a little tricky joining the blade arms back together without moving the blade a little bit. It seems no matter how hard I tried one end of the blade would stick out a little further than the other end. Pushing gently on the blade(don’t do it with your fingers! ), allowed me to position the blade back to its proper position. I found shaving with the SR1 to be straight forward and uneventful. The razor did what it’s designed to do: cut through hair. I had approximately two weeks of beard growth when I shaved with it and it handled my beard beautifully. While shaving with the SR1, it did seem like I was holding it at a relatively shallow angle to my face to shave as compared to shaving with other shavettes, with shallow being closer to parallel to my face. I didn’t have any problems adjusting to shaving with it at all. I did have a few slight nicks, but I wasn’t concerned as this was my first time shaving with it. I’m sure if I paid a little closer attention, I wouldn’t have nicked myself. As with most shavettes, some hairs did get wedged between the blade and the blade arms during shaving. This was a very minimal amount and didn’t affect the shaving performance. Most of the hairs were able to be washed away with just the force of the water from the faucet. If you have never shaved with a shavette or straight razor, it will take some time to get used to shaving it. You need to develop the muscle memory in your hands and fingers. Until this occurs it may feel a little awkward holding and shaving with it. When you are brand new I always suggest trying to shave the inside of your arm first. This gives you an opportunity to see the type of angle that you need to hold it at in order to shave hair. I also suggest you only shave your cheeks to begin with and move on to other areas with each shave. As you shave you’ll become more experienced and you will naturally be able to shave more of your face each time you shave. Despite the initial appearance with the black stuff, the Parker SR1 proved to shave really well and the process to insert the blade was simple. My only complaints primarily consist with aesthetics of it. I don’t think a brand new razor should have any sort of pitting and I do wish I didn’t have to clean the black stuff off of it. At the same time I can understand getting it 100% clean would likely increase the cost of it. Overall, I have no problem recommending it as a shaving razor. If you buy it I think you will be happy with it, as long as you are willing to put in the effort to learn to shave with it if you have never used a shavette or straight razor before. Hi Forrest, thank you for taking the time to comment. I encourage all people to try it out. It really does make shaving a lot more enjoyable. Hey man, I just dropped by to say thanks for all help and information you’ve shown in the videos and posts. I just bought a shavette by dreadnaught, and opened it last night. I actually came across your website a couple of hours before I decided to open the package with the shavette in it. So that is how I found your site (which has a lot of resources; kudos to your efforts). I primarily used DE before (I have a merkur 34c, gillette tech, edwin jagger 89 and a muhle 2013) and all of them shave quite well, as long as the blade angle is there. I still will use them from time to time, I like to mix things up and am not a fan of abandoning any tools. However while shaving with a DE I’d nick myself sometimes and it wasn’t always because of my technique; I really have the urge to manually adjust the angle myself while I shaved (almost like an instinctual thing like having control over sculpting something). The problem with DE razors is that there is a certain limit to the angles you are allowed to use, and it also depends on which DE razor you use as well. So because of this I decided to get a shavette. I have heard people make a transition from shavette to straight after a year or so; usually due to other reasons besides an optimal shave. I don’t think I’ll be doing this because I am usually just after a good shave, and I still get to shave in a similar manner as a straight anyways (without honing and stropping, and I have read that some people only use straights on weekends or certain events because it is quite tricky to hone and strop it properly). I do have a question though. Why is it that people make a switch from shavette to straights? Everywhere I’ve read people have gotten excellent, sometimes even better shaves than from their straights. Some have written that it is unforgiving compared to a straight, but even this argument does not it well with me. It might be that it is sharper (which actually I also would believe depends on both the lather and blade used) but if a shavette is mastered doesn’t that mitigate the “unforgiving” nature of the tool? At some point this stuff does tend to become muscle memory hence why experienced shavers can do it faster and at the same time not nick themselves. The other argument I have seen, is that straight razors give a more smooth shave. I initally did understand this issue… until I found out that DE blades are not the only blades that shavettes can use (As you talked about in your dovo shavettes). And with that, I found some claiming that shavettes are even smoother than some of their straight blades (especially with the specialized blades made for feather artist). I think even changing the choice from a feather blade to an astra could make the shave smooth. Anyway I do know that with shaving, it depends on person to person. Still I find it a bit odd that there are a huge amount of people switching to straights. I considered shavettes to be a class of its own. Is it really just a stepping stone? Yeah, DE’s can be awkward to hold at times. My personal experience with shavettes/feathers vs straights is that I do tend to nick myself more often with the shavettes/feathers than when I use straights. I’m not sure how to explain it, but it’s like I have a better feeling for where the cutting edge on the straight razor is than I do with shavettes. I also consider shavettes and feathers to be a class of their own when compared to straight razors. A lot of people will refer to them as straight razors, but I don’t think that it should be done since you do not hone them and they take a replaceable blade. I think one reason why people switch from shavettes to straight razors is that they were really wanting to try out straight razors, but didn’t want to invest as much money to try straights outs only to find out they don’t like it. 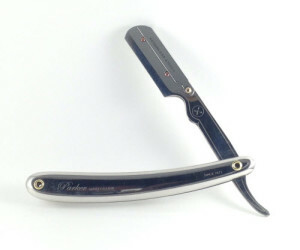 Another possible reason is that they are satisfied with the shavette, but they are naturally inclined to wonder how shaving with a straight razor compares to shaving with a shavette. I don’t really consider it to be a stepping stone. I just consider it to be another tool in the shaving tool kit that men can use. I like shavettes and feathers because you can replace the blade and not have to worry about honing and stropping. I also like to take them traveling with me as well because I don’t have to worry about carrying a strop with me and finding a place to set up. With all that being said, I do get a little nostalgic when I pick up a straight razor after not shaving with one for awhile. There’s a certain allure and elegance that a straight razor has, that a shavette just doesn’t have in my eyes. Next: Safety Razor vs. Cartridge Razor, Which One Is Best?